...that the United Nations was placed in charge of Earth's national governments once humanity started colonizing nearby planets? ...that Tribute is a major human colony with a strong economy and large industrial capacity? ...that Mantle's Approach, the Didact's flagship in Halo 4, is over 371 kilometers tall? Larger, more heavily muscled; avian features, beaked head with teeth, clawed hands and feet. The T'vaoans, referred to by humans as Skirmishers, are a subspecies of the Kig-Yar hailing from asteroid colony of T'vao. They served the Covenant as a specialized group in the military. The T'vaoans originated on the Kig-Yar homeworld of Eayn. They eventually colonized other locations within the Y'Deio system, primarily the asteroid T'vao, from which they earn their name. The higher gravity, more dramatic atmospheric shifts, and other harsher environmental conditions on T'vao led to the Skirmishers evolving very differently to other Kig-Yar. When the Covenant made peace with the Kig-Yar after a battle in the system, T'vaoans were recruited into the Covenant's military. 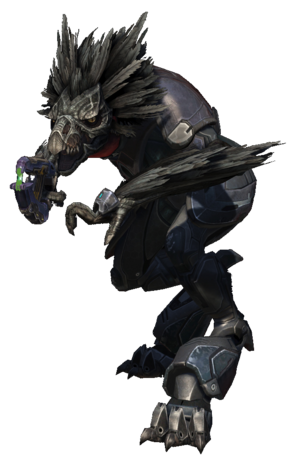 Many T'vaoans served in the Human-Covenant War, often being led by Sangheili or Jiralhanae. In engagements prior to 2530, mixed units containing both Ruuhtian and T'vaoan Kig-Yar were more common; however, this changed toward the end of the war, with Covenant doctrine favoring units comprised solely of Skirmishers. Several Skirmisher squads saw action during the Battle of Hat Yai and Battle of Actium, among other engagements. During these engagements UNSC forces managed to capture the hologram technology used by the Skirmishers. They saw extensive action during the Fall of Reach, and as a result of catastrophically high casualties, the Skirmisher ranks were utterly exhausted, though the subspecies as a whole did survive. Despite the amount of T'vaoans that died in the Human-Covenant War, many still remain. The T'vaoan Shipmistress Chol Von attempted to create a united Kig-Yar government to defend the Y'Deio system from threats, while others, such as Sav Fel, returned to the Kig-Yar's ancient ways of piracy. At least one T'vaoan joined Vata 'Gajat's mercenary group, serving as 'Gajat's second-in-command. T'vaoans are a subset of the Kig-Yar species hailing from the isolated environment of T'vao. The morphological variation among the Kig-Yar represents divergent evolution in response to varied environments on prehistoric Eayn. Xenobiologists believe that the asteroid's higher gravity and atmospheric shifts led to the development of the T'voans' avian features. They are much faster and stronger than the more lightly-built common Kig-Yar, known to humans as Jackals (particularly the Ruuhtians and Ibie'shan). They have darker skin and stockier, squared heads with small yellow eyes with slitted pupils, as opposed to the bulbous and pale eyes of the Ruuhtians. They also have more beak-like mouths and bony facial coverings. Skirmishers have true feathers on their head, back, and arms, unlike the Jackals' quills. A Skirmisher's voice is more raspy and guttural—this is because they have an expanding voice chamber on their throat. Skirmishers served as Covenant shock troops, while the more lightly built Jackals saw deployment as dedicated ranger or sniper units. Unlike other Kig-Yar, Skirmishers do not display color changes in their plumage when their moods shift. Their head shape appears to be more avian than their cousins; their skin tone is noticeably darker and not yellowish. Like Jackals, Skirmishers have sharp talons on their hands and feet. Male Kig-Yar from T'vao had much heavier upper body plumage than other Kig-Yar. Females from T'vao had a ruff of feathers on their heads and necks instead of scales. Young T'vaoan chicks are covered in a brown fledgling down which gradually moults and gives way to scales and plumage as they age. While Kig-Yar are generally quite agile across all subsets, Skirmishers are capable of sprinting at great speeds; many T'vaoans are capable of reaching up to 72 kilometers (45 miles) per hour in open environments. They are also especially capable jumpers, being able to leap considerably higher and for longer distances than other members of their species (as well as the other species that made up the Covenant). The blood of a T'vaoan is thick and purple. T'vaoans have a culture largely similar to most Kig-Yar, although most T'vaoans believe themselves to be superior over the rest of the Kig-Yar. Among T'vaoans, it is often considered "bad form" to treat a T'vaoan like an average Kig-Yar. Like other types of Kig-Yar, T'vaoan society is described as matriarchal. T'vaoans are attracted to shiny, glittery and glamorous objects. Males often squabble amongst each other and display their quills for females. The Covenant used Skirmishers as close-range combatants, attacking in packs and using lightning-fast flanking tactics, as opposed to the mainline Kig-Yar troops, who were often used as defensive and long-range combatants and assassins. Anatomically, they possess a profile similar to regular Kig-Yar, though in combat they do not wield large rounded energy shields like the Jackals. High-ranking Skirmishers do wear point defense gauntlets or wrist shields, medium sized ovular shields strapped on to their wrists, to help them deflect bullet and light plasma fire. Apart from combat roles, and like the common Kig-Yar, the T'vaoans could hold commanding roles such as the title of shipmaster in the Covenant military. While Covenant remnants such as Jul 'Mdama's Covenant use Kig-Yar (Mostly Ibie'shans, though Ruuhtians have also been seen) in much the same roles as they had in the original Covenant, it is unknown if any T'vaoans serve in the same manner. It is possible that the depletion of their numbers at Reach has deterred any more T'vaoans from participating in the military. Fresh T'vaoans started as Skirmisher Minors (marked with black feathers and grey armor) and were promoted to Major (marked with red feathers and greyish-red armor) once they accumulated sufficient combat experience. There were several specialist ranks for the Skirmishers. These specialists were equipped with their own variation of combat armor and given equipments to fulfill their specific, respective roles. The Murmillones, for example, in their orange armor, were equipped point defense gauntlets on each arm. The Commandos, on the other hand, would be seen in green armor and were equipped with a holographic projector. Leading the Skirmishers in combat was the Champion, outfitted with heavier gold armor and sometimes employing holograms to confuse their enemies. French Les Écorcheurs in all media. Skirmishers bear a notable physical resemblance to dromaeosaurs such as Deinonychus and the smaller, better-known Velociraptor. Like the Skirmishers, the dromaeosaurs were reptiles with prominent avian features including feathers and lightweight bones. Dromaeosaurs are considered to be one of the main taxonomic links between dinosaurs and modern-day birds, perhaps suggesting a similar evolutionary progression among the Kig-Yar. Concept art of a Skirmisher. An alpha build render of a Skirmisher's face. An alpha build of Reach, showcasing a lance of Skirmishers in battle during the Fall of Reach. In general pattern on the Skirmisher armor in Halo Reach. A Skirmisher Commando in Firefight. Skirmisher Murmillo armed with a focus rifle. Several Skirmishers of differing rank. Tek, a Skirmisher operating with Vata 'Gajat's mercenary group.